A call leads to a chase and an altercation with law enforcement. Authorities were called to investigate a possible disturbance and property damage on March 10, at 1:10 am at the 1200 block of Arlington. 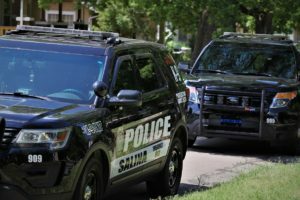 Captain Forrester told The Salina Post that an officer made contact at the residence, and the family of the suspect said that he was acting paranoid and tearing stuff up like pulling things out of the closet. When the officer made contact, Derek White, 27, of Salina took off running out the back door. The officer was able to catch him and then a physical confrontation happened. During the altercation, the officer’s on body camera holder and a whistle was damaged. White was charged with criminal damage to property, battery of an LEO, and interference with LEO.